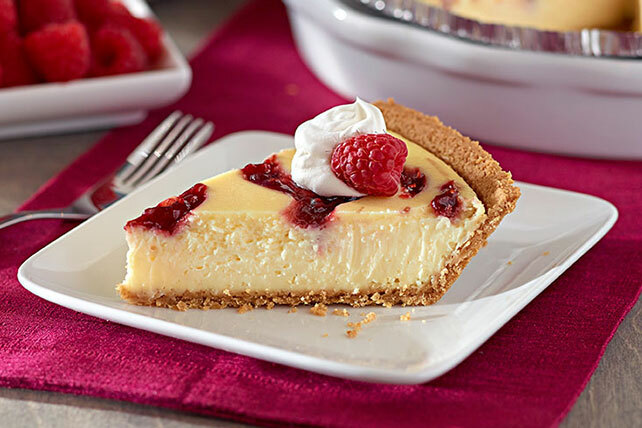 Enjoy the delicate fruity swirls in this PHILADELPHIA 3-STEP Raspberry-Swirl Cheesecake. Take only 10 minutes to put together a raspberry-swirl cheesecake. Pour into crust. Dot top of batter with preserves; swirl gently with knife. Bake 40 min. or until center is almost set. Cool completely. Refrigerate several hours. Serve topped with COOL WHIP and raspberries. Rich desserts like this cheesecake can add enjoyment to a special occasion, but choose an appropriate portion. Prepare recipe as directed, substituting peach preserves for the red raspberry preserves. Omit crust. Line 8- or 9-inch square pan with foil. Melt 1/4 cup butter; mix with 1-1/2 cups graham crumbs. Press onto bottom of prepared pan. Prepare cheesecake batter as directed; pour over crust. Bake, chill and add topping as directed.